At a recent Xbox One event we went hands on with the game’s two player online co-op mode. This mode puts you in the shoes of a gladiator, fighting in an arena that dynamically changes as you face off against waves of enemies. Matches start out with each player choosing a god. Each god gives you a special ability and power to use during the matches. I had chosen Apollo which granted me bonus life. There were only four gods to choose from in the demo we played, but there may be more in the final version. Once we dropped into the arena it was easy to see how Ryse is trying to capture the cinematic and ambitious feel of a movie like Gladiator. Graphically the game looks decent, though as someone who frequently games on a PC, I wasn’t blown away. The character models are detailed, and the lighting and ambience of the arena really set things off, but the animations still feel stiff and clunky. Textures are noticeably improved over the previous gen, so much so, as being able to see the hair on your character's legs - which might be going too far. Combat itself was better than expected, Ryse plays a bit like a modern brawler. While combat isn’t as fast for fluid as say, God of War, it is satisfying. Using both a sword and shield you can perform light, heavy, and special attacks. Timing blocks with the shield allow you to parry and weakened enemies can be finished to the delight of the crowd. As my partner and I worked through the waves of enemies, different objectives popped up. In one wave we were tasked with holding a specific area in the arena, another wave required us to knock over boiling oil into pits that spawned enemies. These changing objectives keep you on your toes and mobile as you complete each wave. Sadly it doesn’t feel like there is much in terms of co-op. Sure we both were fighting in the same arena - but there aren’t any co-op moves that we could discover. There’s no way to grapple an enemy and have your partner finish him. There’s no back to back fighting to fight off the waves of enemies. And you can’t crouch down, hold your shield up for your partner to jump off of in slow motion, screaming “SPARTA” all the way. Ok, so perhaps the last one is a tall order, but how COOL would that be? 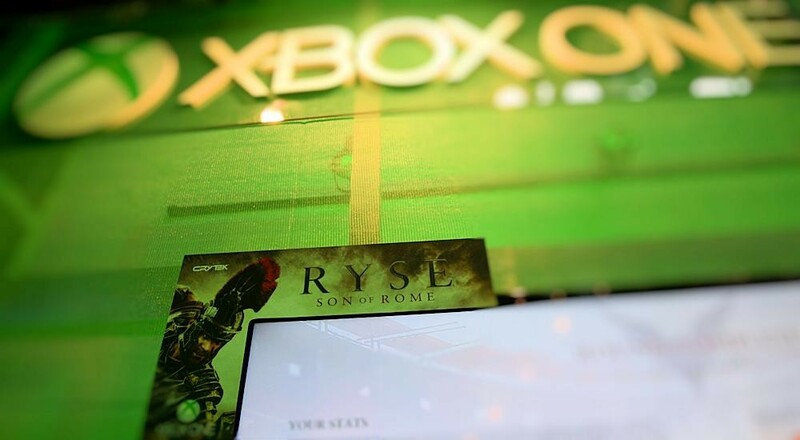 Ryse’s co-op mode won’t sell the game, but it does feel like a decent distraction. Once we complete the level we were given gold and experience to presumably, level up our character and customize further. The first thing I’m buying my guy is a pair of pants, because the next generation has a little TOO much detail for my comfort on the upper leg area.